You probably don’t associate Asian flavors with Thanksgiving. So when you’re tired of traditional seasonings and still have leftover turkey, try this Spicy Coconut Turkey Soup laced with ginger, garlic, and hints of tropical flavors. This soup is equally good when made with chicken. If you don’t have any rice noodles, angel hair pasta or vermicelli will work too. Cook a pot of Turkey Lentil Soup using the turkey carcass. Use turkey instead of chicken in Chicken Kale Salad with Fresh Ginger Dressing. Skip the “cook chicken” steps and use turkey in Asian Chicken Noodle and Spinach Soup. In a stock pot, combine chicken broth, garlic, bay leaves, ginger, lemon zest, lime zest, red pepper flakes and fish sauce. Bring to a boil over high heat, then reduce heat and add milk and coconut milk. Simmer for about 20 minutes. Strain the soup and return to pot. Add turkey and rice noodles and cook over medium heat for about 5 minutes, or until warmed through. Ladle into bowls and add any desired garnishes. 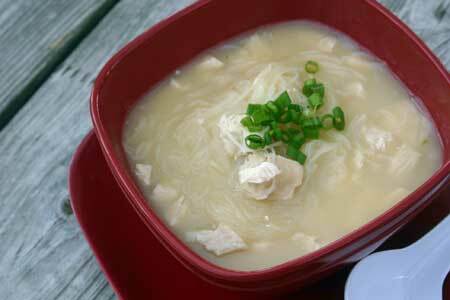 This soup is a good source of Phosphorus and Selenium, and a very good source of Protein. (Source: nutritiondata.com). 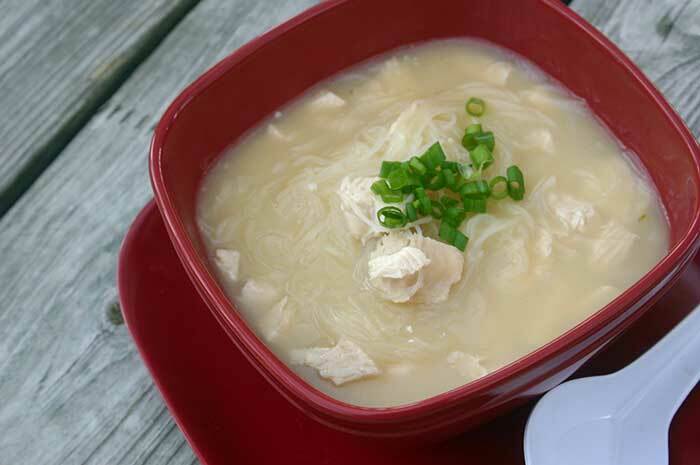 If you are watching your sodium intake, you may want to use homemade, unsalted chicken broth. The #SundaySupper gang will be sharing Thanksgiving Leftover recipes all afternoon on Twitter, Facebook, Pinterest and Instagram on Sunday, November 18, 2012. We will also have a live chat at 7 p.m. EST on Twitter and will be using the hashtag #SundaySupper. We look forward to answering questions, giving tips and inspiring you to spend more time Around the Family Table with those you love! Thanks to Nicole of Daily Dish Recipes for hosting this event. I love soup and can’t wait to try this Spicy Turkey Coconut Soup! Wow! I love doing this with chicken but never thought to do it with my leftover turkey. Great recipe! I do like the idea of switching it up a bit and putting a twist on those leftovers. And I love any sort of coconuty sort of dish – so I’d love to try this! I love turning leftovers into something completely different – the Asian twist is perfect! Okay, the coconut in the soup??? Genius! Great idea – passing on to my sister a lover of all things coconut! I cant wait to try this turkey soup. The coconut has intrigued me. The flavors in this soup sound amazing! Spicy, healthy, and delicious! Nice job! This steamy bowl of goodness looks fantabulous! I think turkey is a pretty versatile meat and works with almost any cuisine. Great idea for turkey leftovers! Oooh, mom will like this after xmas turkey! sounds lovely! the spicy asian spin is awesome. Gorgeous healthy soup! Great leftover idea. I love soup and this looks amazing! I will have to try it. Thanks for sharing. I actually have all the ingredients for this right now, well except the turkey (but I bet chicken would work too shhh)I love thai and asian inspired dishes! Yes I will take some coconut in my turkey soup please. That sounds delish! This is awesome, because sometimes after a few days of leftovers, you want a dish that tastes completely different. Asian flavors are my favorite so I would happily eat them on Thanksgiving! This soup looks great! This is a great way to use the leftover turkey! As much as I love the traditional Thanksgiving flavors, it’s nice to make something completely different with the leftovers! What a great idea to add in coconut milk in the soup! Bookmarked!